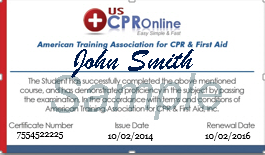 Our Basic Life Support (BLS) certification follow the latest American Heart Association and ECC/ILCOR guidelines and are nationally accepted. The Basic Life Support (BLS) course is designed for first-time participants as well as people who are renewing their certification. You always have an option to take the exam once you have reviewed the course. This course teaches latest Basic Life Support (BLS) techniques to address the most common situations that can happen in the workplace, community and healthcare setting. This course is designed to train you to respond to emergencies. You will also learn essential life-saving techniques to feel confident in situations where immediate action can make all the difference. The course is developed by U.S. board certified physicians. Regulatory Definitions: This section explains exposure determination and methods for creating a safe work environment that is in compliance with national standards. It discusses how to engineer preventative controls, including sharps safety items like disposal containers and self sheathing needles. Furthermore, it explains precautions and protocols for handling other potentially dangerous equipment including sharps, broken glass, and glass lab equipment. Epidemiology and Personal Protection: This section explains HBV, HCV, and HIV with its exposure routes. Risk of infection, incubation period, symptoms, vaccination availability, and OSHA Standards for each virus is presented in a manner reflective of a care provider’s responsibilities and best interest. AIDS and related complex symptoms are presented and explained. This section also illustrates the types of personal protective equipment that can be used to prevent the transmission of Bloodborne pathogens including gloves, gowns, and masks.